Did you watch the second Trump-Clinton debate? We watched. And talked about it, and read it, and formed opinions, etc. 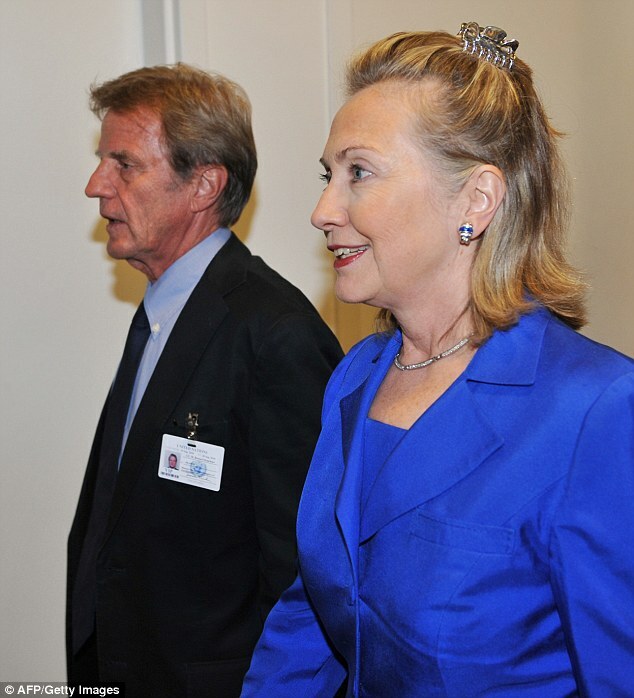 After all was said and done, though, earlier tonight I was curious: who was Hillary wearing? Because – for those of you who don’t follow politics – she has looked really nice lately. 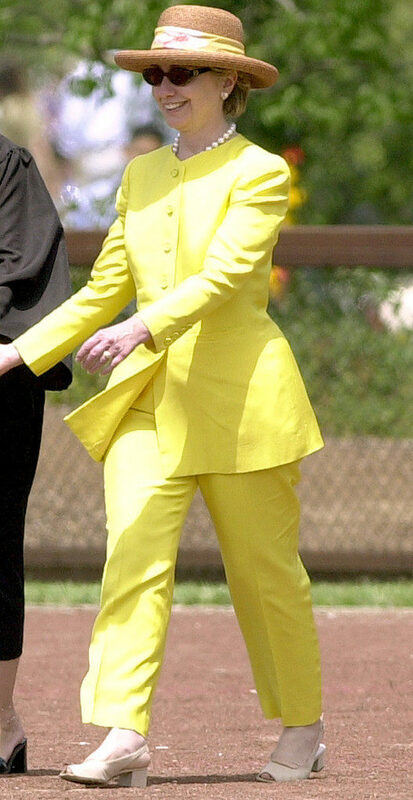 Clinton herself will crack jokes about her style. She’s a serious, intelligent woman, and she’s not interested in fashion. For those of us who loosely follow politics and are interested in fashion, her disinterest is a fact. Her disinterest means she’s made some truly bad choices. I’d go so far as to say her fashion choices are her most questionable choices, by far. It’s so awful, I can’t even. Last night, I was pleasantly surprised. I thought she looked great. I also thought she looked great in red at the last debate, and again in white when she accepted the Democratic nomination. Snoozefest, am I right? 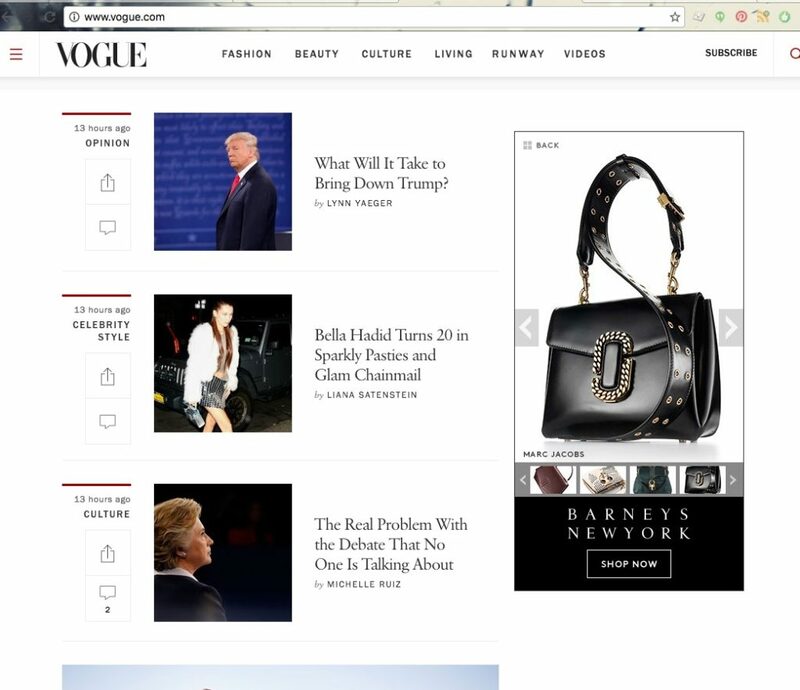 But also – I don’t care what Vogue’s opinion is on Trump’s platform. I want Vogue to dish on his outfit, the fabric in his tie, or something fashion-related. 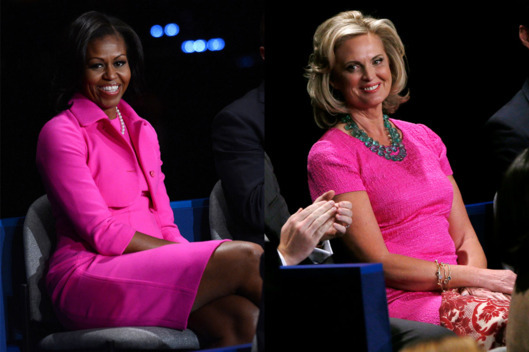 Easy slideshow idea: at the last presidential debates, both Michelle Obama and Ann Romney showed up in hot pink. Remember? Throw those images up along with a couple of Melania in hot pink. Boom. Maybe even (bonus) reference Hillary’s most famous pink suit – the one she wore while speaking in 1995 in Beijing – arguably, her boldest, savviest fashion choice to date. (Wearing a pink suit while declaring: “human rights are women’s rights, and women’s rights are human rights, once and for all.” Brilliant!) But no, not Vogue. It’s perfect. The Times post describes it as: “a Ralph Lauren navy wool double-faced pantsuit with a cream shawl collar and cream wool top”. The other suits I’ve liked her in have also been Ralph Lauren. 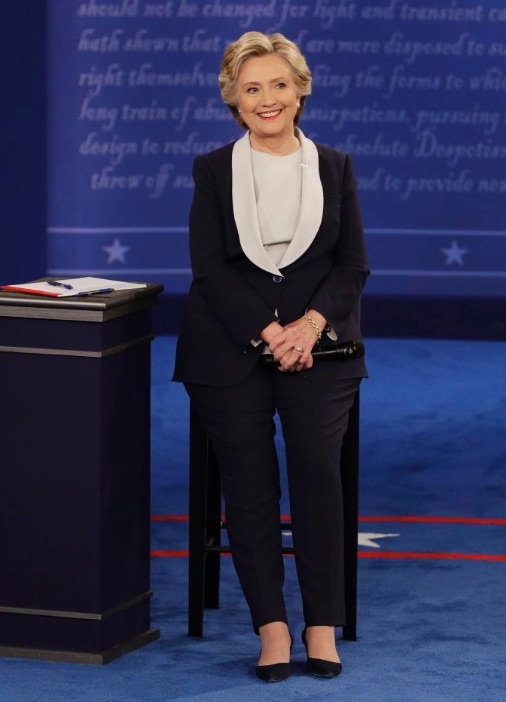 In the past, Clinton has worn a lot of Nina McLemore and Oscar De La Renta, both of whom might have been good designers, but don’t seem to have done Clinton any favours. Who knows if she didn’t consult them enough, or if they didn’t offer. 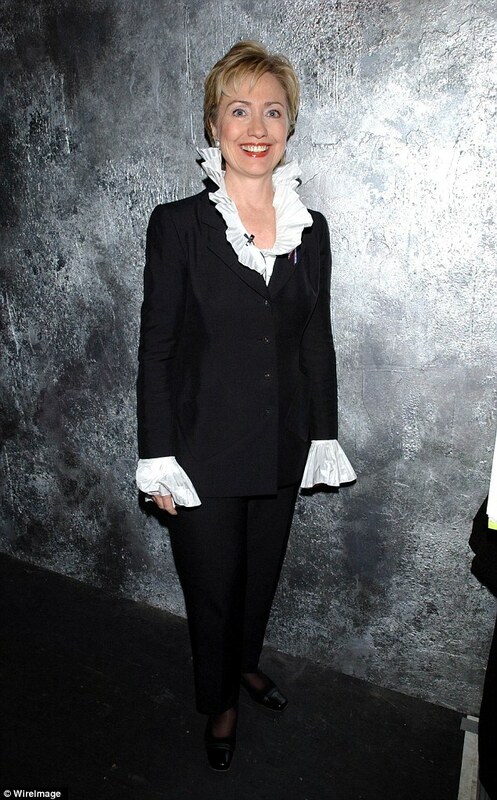 Who knows if she wasn’t taking fashion seriously enough. But, clearly, whatever she’s done for most of the past has not worked. 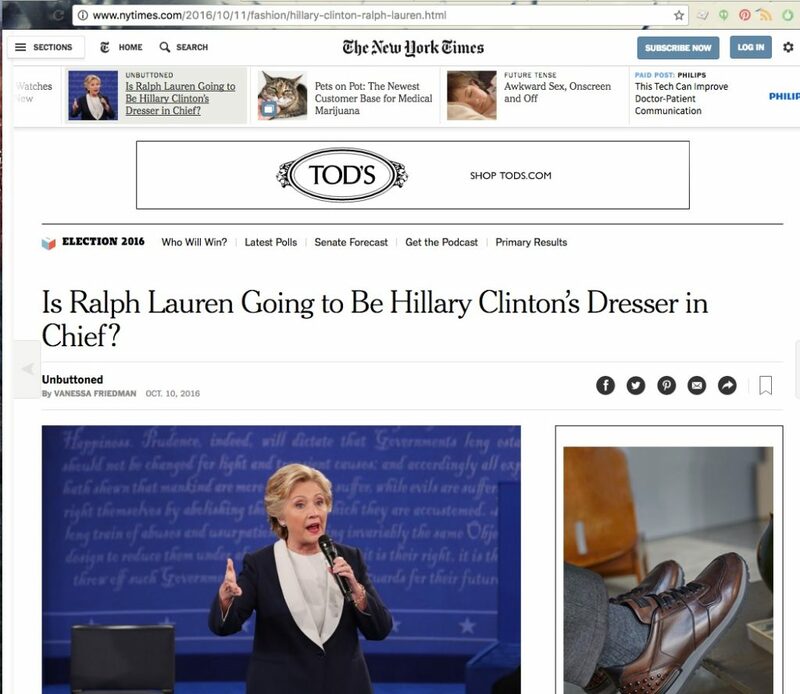 Another NYT piece about Clinton in Ralph Lauren during this campaign mentioned that Ralph Lauren is expensive. She may be seen as “inaccessible” if she lets it out that she wears him. To that, I say: “pshaw”. You guys, whatever Ralph Lauren is doing is fine by me. If he’s behind all of this, and is making her look so professional – and, dare I say it – presidential – he’s doing great. In fact, if he becomes her dresser in chief, and designs all her outfits, I would have no problem. from ever happening again, is money well worth spending.